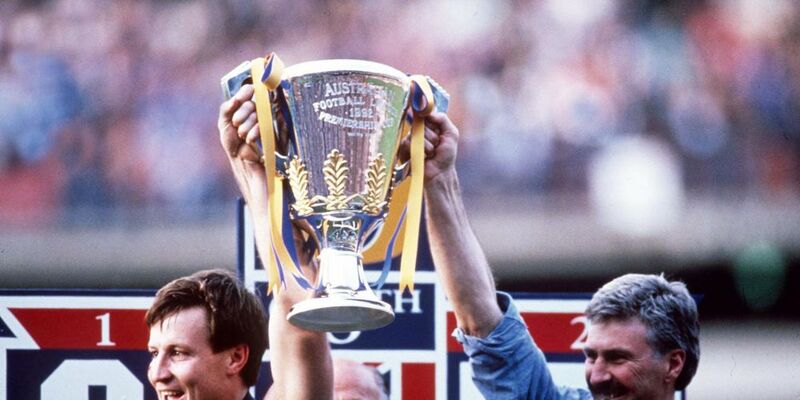 THIS September marks 25 years since the West Coast Eagles changed the landscape of Australian rules football forever. Although the Victorian Football League (VFL) had been expanded outside the state since 1983, when South Melbourne became the Sydney Swans, the Swans’ finals appearances in 1986 and 1987 ended in beltings. No non-Victorian team had won a final until 1990, when West Coast beat Melbourne in the midst of a horrendous run of six games on the road. They won two finals in 1991 en route to a grand final loss against Hawthorn, before going all the way in 1992 to become the first side from outside Victoria to win the premiership. However Eagles coach Mick Malthouse took no pride in that piece of history, although there was plenty of satisfaction elsewhere. “I’m very proud of the West Coast Eagles winning a title from fourth spot, the way we did it,” Malthouse told Community Newspaper Group. “Coming from fourth is hard enough; coming from three or four goals down is unbelievable. “And to have the quality kids who were part of the football club, that’s what I’m proud of. “To win that game, when we’d lost the previous year, is testament to the courage of the players – led by Johnny Worsfold – the board, the administration, and a very close friend of mine, Trevor Nisbett, who stood by me as a team manager for a lot of years. His fearless skipper Worsfold came in for special praise from his old coach. “Johnny Worsfold’s effect on that (team) can never be underestimated; he was outstanding,” he said. Malthouse was in just his second year as coach of Footscray when the prospect of expanding the VFL further was floated, and he saw it as a natural progression. “The football competition was going to die; if it didn’t go national it was going to die on the vine,” he said. “I was a young coach. I reckon the young people of the competition saw it as a natural progression. “Worldwide, sport had taken a different course. While it may have been easier, it still wasn’t easy and Malthouse lamented the number of finals his side had to play in Melbourne. “It’s just ludicrous,” he said. “What the Eagles had to put up with when I was there; I reckon there were seven finals that should have been at Subiaco. Former AFL chief executive Ross Oakley said the Eagles’ premiership was a watershed moment for the competition, as it gave non-Victorian sides belief the fortress could be breached. “I thought it was great to have a non-Victorian team win a flag,” Oakley said. “That’s what the national competition’s all about. “We rejoiced enormously with West Coast winning; there weren’t too many others in Victoria rejoicing. “That was the start of it. On a recent episode of football interview show Open Mike, Peter Sumich credited the side’s run to the 1990 preliminary final – which saw the Eagles traverse the Nullarbor six weeks running – as the catalyst for 1992’s success. “I remember after Essendon beat us in the prelim, thrashed us by about 10 goals, we went in the change rooms and Mick came in and he cried,” Sumich said. “That’s the first time I’ve seen Mick that emotional, because he couldn’t believe what we achieved, with the travel. “He was that proud of the group. Malthouse agreed that the seeds for premiership success were sown in 1990. “Through adversity you gain,” he said. Malthouse coached for another 23 years after his first premiership success, leading the Eagles to another flag in 1994 before masterminding Collingwood’s premiership success in 2010. After a lean run at Carlton he was sacked in 2015. Despite a gruff public persona and testy performances at press conferences, there was never any question Malthouse’s players would have run through walls for him. When asked how he’d been able to maintain the devotion of his players for 32 years as a coach he said, “you can’t be a fraud in this game; people can see through you”. When asked what motivated him for all those years, Malthouse offered a rare glimpse beneath his public mask. “I can hardly remember a victory, but I’m scarred by every defeat,” he said.